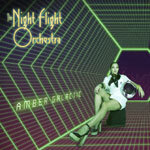 With the third album, Amber Galactic, the reputable crew that forms The Night Flight Orchestra continue their pretty easily predicted orbit around 70's influenced light hard rock. As always with this unit I must point out that the music which they perform has close to nothing in common with what they usually put out with their main bands, meaning: if you haven't heard this band's music before, you should in order to get the most possible out of it absolutely try to approach it unprejudiced and as an independent musical experience. Regarding retro music there's really a fine line between good and contrived stuff and I think that The Night Flight Orchestra without a doubt belongs to the first category out of those two, because the band certainly has the ability to capture the right atmosphere in the music to make it kind of belong to a traditional epoch and as I listen to the record I quite often think about this particular music style's origin and realize that this record in pretty much no way is something that genre-wise would have to be separated from an older generation's record collections. Surely a guitar solo or two, some stuff here and there and of course the overall production over the record are results of current conditions, but they otherwise treat the style with gentle veneration and put classic elements in the right place to get an effective connection to past times. Frontman Björn Strid once again proves that he masters the art of just being a normal singer over a quality foundation and I think that the group as an entirety carry the whole thing out properly and is probably one of the greatest bands that's active in this type of music today.